*Previous mixes on mixcloud* Biography: It was never quite the intention of architect and graphic designer, Jacqueline See - aka Kraken - to become a DJ. When she first plugged in to the sounds of Sensient’s Antiflouro album, there was no going back. Living with two talented DJs also meant there was no getting away from the infectious scene known as psychedelic trance. The enthusiastic prog-head was instantly hooked - so she hit the ground running, and hasn’t looked back since. The groovy, glitchy, psychedelic and industrial sounds of Zenon ignited Kraken’s burning curiosity to research and explore rarely heard, quality tunes; taking the listener on an adventure through the wonders of dark progressive soundscapes. A growing number of outstanding labels and artists have given Kraken the momentum to develop a sharpness for sourcing and playing the choicest tracks. From Zenon to Uroboros Records and many other dark progressive labels in between, Kraken takes her inspiration from some of the pioneers of the dark progressive sound and has played alongside Sensient, Hypogeo, Kained & Able, Brujo’s Bowl and Mirror Me. 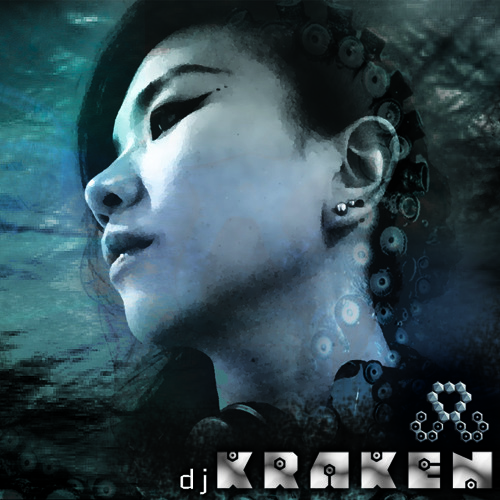 DJ Kraken’s journey kicked off in the confines of the London underground music scene back in 2012. She quickly joined the ranks of the Psy-Sisters management team as a Digital Design manager, overseeing creative projects and participating in a global web campaign to support female artists. A fearless move to Goa in 2014 set the precedent for a fresh new adventure as she hits the Indian dance music scene to play at events such as Delhi’s Sound Escape alongside the likes of Captain Hook and Audiogramme. Kraken has also projected psychedelic bubbles of positivity from the decks at Goan venues such as Disco Valley and UV Bar. Consolidating her talents as both a DJ and graphic designer, DJ Kraken recently launched the Kraken Lab showcasing both her music and graphic works. The Kraken Lab was built to experiment, explore and share her creative passions.